A young Nuñoan woman, part of the Quechua indigenous peoples in Peru, spinning yarn following training in traditional handicraft techniques. 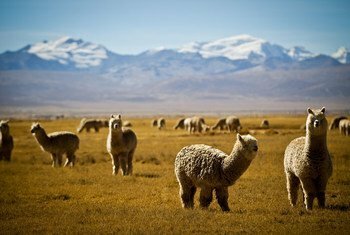 Indigenous people in a remote mountain town in the Andes in Peru are being helped to boost their incomes by preserving a valuable but threatened breed of alpaca. The Suri alpaca, an animal which is similar to a llama, is known for its soft coat which makes high quality but delicate yarn. In recent years the Suri yarn has lost popularity because it’s harder to spin, dye, knit and weave. As a result, local communities have turned towards more profitable alpaca yarns. Now, with the support of the United Nations Development Programme (UNDP), those communities are becoming reacquainted with the traditional knowledge and techniques needed to work Suri, and crucially, learning how to market their goods from a remote location. On International Day of the World's Indigenous Peoples marked annually on 9 August, artisans and herders in the Andes, are now faced with a new challenge, keeping up with increased demand for their Suri fibre.